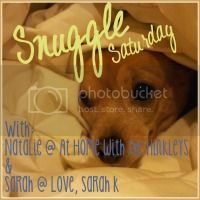 Welcome to another edition of Snuggle Saturday! I don't have a Valentine's Day that was bad in any real way. I suppose the ones where I didn't have a date were pretty boring, but I have never been too sad about anything on Valentine's Day. To me, it is about all sorts of love aside from romantic love, and I am lucky that I have never ever lacked in that department. and co-hosts, Nicole at Pharr Away and Mandy at Through the Newlywed Lens. Grab the button and be sure to visit two other bloggers! 1. Are you rooting for any film or actor/actress to win? 2. Nominated or not – what was your favorite movie of 2012? 3. Do you have a favorite best/worst dressed Oscar attendee from any year? 4. What would you wear to the Oscar’s?? Haha! You and Aaron crack me up! You were afraid he'd burn your apt down! :) bwahahaha!